Absolutely disgusting… what an idiot! Our veterans always pay a price for their service. Sometimes it’s the ultimate price, but other times it’s physical or emotional scars that can last for an entire lifetime. An unnamed vet in Austin, Texas, is one of those veterans. He sustained lower body injuries while serving his country. Because of their severity, he has a “disabled veteran” license plate. However, that didn’t stop a stupid neighbor from coming out and leaving a note on his car for parking in the handicapped spot in his apartment complex, according to Fox News. “Hey Buddy, Stop parking in handicap spots!!! !” the note began. “You DO NOT have a sticker nor do you look handicapped. I have taken a picture of your license plate and sent it to the office for towing by the courtesy officer. 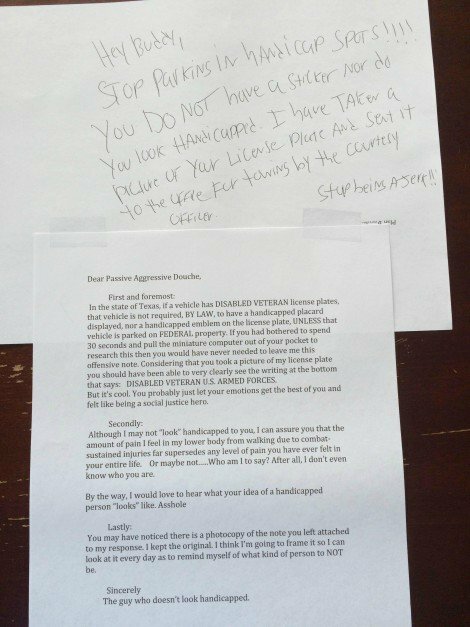 “First and foremost: In the state of Texas, if a vehicle has DISABLED VETERAN license plates, that vehicle is not required, BY LAW, to have a handicapped placard displayed, nor a handicapped emblem on the license plate,” the letter read. “Considering that you took a picture of my license plate you should have been able to very clearly see the writing at the bottom that says: DISABLED VETERAN U.S. ARMED FORCES. The mistreatment of our disabled veterans is one of the most egregious offenses any American can make. Whoever wrote this note better hope to stay anonymous, because this note isn’t going to make him any friends — and with good reason.